Last week, we were blessed with a lot of rain in Dallas-Fort Worth. The rains brought some flooding along the path I ride. I wised-up and chose not to ride this route on my way back home, as the forecast had more rains for the rest of the day. Here is a quick video of the same. As a consequence of the rain and the blossoming of Spring, the scenery on my bicycle commute route was quite nice. I saw several birds. Blue Herons, Cormorants, White Cranes, and quite possibly even a Pelican (hard to tell from a distance without a telephoto lens). Since last Spring and Summer, I did seven days of consecutive bicycle commuting last week. It felt good to ride the bicycle. The fact the Catalytic Converter was sawn off my Honda Element was also instrumental. As I was crossing Denton Creek, I saw a nice Spider Web on the bridge. There was a little mist/precipitation on the web, but the web was quite intact. Spiders are incredible builders of almost indestructible webs. Lastly, here is photo of a cyclist seen riding home from work. 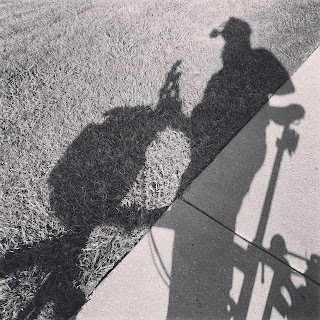 Linking with Saturday's Critters, Shadow Shot Sunday 2. Happy Easter to all those who observe the holiday. We had a lot of rain here, too. Fortunately no flooding where we are. Love the spider web. Nice find! Hello, you saw a nice variety of birds. That is a flood, I hope the water receded quickly. Thank you for linking up and sharing your post. I appreciate your visit and comment. Happy Saturday, enjoy your weekend. Happy Easter to you and your family. That looks like a lovely commute! I have to say that the shot in the middle on the top looks a bit like the Loch Ness Monster! Wonderful shadow shot and lovely nature photography! The spider web was a superb find! It is great that you are able to commute by bike (especially if somebody vandalizes your car good grief).... but the nature and beauty you see by bike , most of it you probably wouldn't even notice in a car. Thanks for sharing .